Originally from South Africa, Clivia miniata are the the most popular of the genus and are widely hybridised especially in Japan. The flowers of this species are open and upward facing and although the common varieties are orange the hybrids are a fascinating range of colours. C. miniata var. citrina is a yellow flowering plant that is much sought after. Clivia miniata variegata has yellow and green foliage. We also have the well known ‘Belgian strain’ characterised by broader leaves than the species also known as ‘Belgium Hybrids’. A shade loving and drought tolerant plant these are an evergreen perennial that will reach around 70cm. They require a well drained soil and will naturally form a large clump. Propagation is by division of larger clumps, removal of small suckers or from seed. In Japan and China hybridised varieties are often grown as indoor plants in pots, in Japan for the flowers, in China often for the foliage. Easy to grow and requiring little care once established, the foliage is long lasting and besides removing spent flower heads dividing larger clumps is about it. We use a liquid fertiliser, (seaweed or worm casting tea) in late winter, but refrain from over watering in spring unless you have a very dry spell. During the recent drought we rarely watered our clivias and they have thrived. Protection from frost is required. As for hybrids and cultivars, famous growers in Japan include Yoshikazu Nakamura and Shigetaka Sasaki. The much sought after green flowering C.miniata (pictured right) is just one of the many beautiful hybrids. Seed can be collected when ripe and the soft outer coating removed. Clivia seeds need light to germinate and should not be buried, rather gently pushed into the growing medium until one half is left above the surface. Seeds will germinate in a month or two, germination commences by a root developing that pulls the seed down into the soil. Growth is generally slow and may take 5 years to flower. We have orange red, yellow and green flowers. Multipetal forms, hybrids with wider foliage, variagated foliage. Multi colored forms and lots of pastel colors as well. 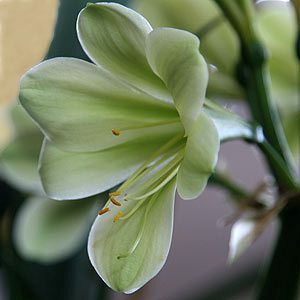 The common forms are esy to find in nurseries, the more exotic cultivars will cost a little more and will ne ed to purchased online or perhaps a Clivia club or society. So if you are looking for an excellent non invasive and easy care, shade loving plant for the garden. 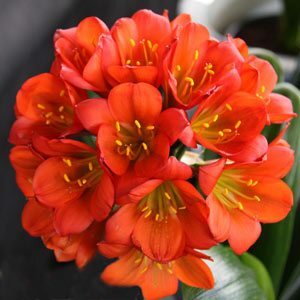 Or perhaps a beutiful long flowering plant for growing as a specimen in a pot or container indoors why noy try Clivia miniata.